If you are an adult child, did your visit to elderly parents unnerve you enough that you are going to call a geriatric care manager to do a geriatric assessment? If so– great idea. 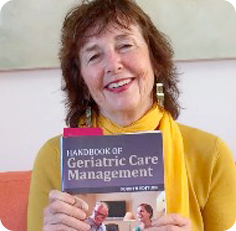 What will the geriatric care manager do to solve your elderly parent’s problems? Part of the geriatric assessment is a functional assessment. What is a functional assessment? . Done by a geriatric care manager (GCM), it measures of the basic skills of role function of an older person. This includes measurement of the performance of basic activities of daily living (ADLs), such as bathing, grooming, dressing, eating, transferring, toileting, and more advanced instrumental activities of daily living (IADLs), including handling financial matters appropriately, finding one’s way out of the home and back, and managing medication regimens. It measures how an older person functions is her environment and helps him function better. Both the functional and psychosocial assessment done by the geriatric care manager will help you have that much needed, post holiday feeling, “ peace of mind”. Another post holiday sigh of relief is a geriatric assessment will you a map of the specific problems that need to be solved and how to solve them –. “ Whew” what a deep breath you can take after all the holiday joy and stress. ➢ Accompany the elderly person to the doctor, and talk to the doctor in person. ➢ Gather legal financial and insurance paperwork, and meet with professionals. ➢ Contact and meet with old and present friends. ➢ If your older family members are in a facility, make contact with staff that cares them, and the ombudsman. ➢ Meet with your elderly relative’s support network. ➢ Meet with a geriatric care manager http://www.caremanager.org/ in the area. The Christmas Carol has old Scrooge, parsimonious and downright mean, sleeping in his gloomy bedchamber. He has spent the day browbeating his employee Bob Cratchit, complaining that he will have to pay him for the holiday, ignoring the penurious plight of Bob’s family and little son, poor crippled Tiny Tim. In the middle of the night the cellar door creaks, an ominous bell starts to toll, and the ghost of his old counting house partner, Marley, lurks into his crypt-like bedchamber. Marley, clanking his loud chains made of cash boxes, ledgers and very bad deeds, drags toward Scrooge, now awakened and terrified. Warning Scrooge about the consequences of his miserable behavior, rattling the padlocks and metal chains that bind him, Marley says he has been lugging these painful shackles since he died, wandering the earth as punishment for his ungenerous life. He says he has come to save old Scrooge from that same fate. Scrooge will be in those irons in his next life if he doesn’t give up the past and live a more humane life in the present, and see his way to changing his foul behavior and learning to live a kinder much more openhanded life in the here and now. Scrooge is made to look back at what started this life of anger and penury. He travels to his childhood with the ghost of Christmas past to see the once sweet little Scrooge who had a nasty father who left the child alone at Christmas in his dilapidated boarding school, reading by a flickering fire. We forward through the three ghost stories to a kind of Dickensian life review, where Scrooge can see that there was also good in his life in old Fezziwig and Scrooge’s sister Fan. His life did have joy, but poor Scrooge kept retreating to his gloomy self, the lonely, neglected child who inhabited Victorian England’s broken-down boarding school system. The next morning he throws opens the window of his bleak London brownstone and yells for all to hear. He has transitioned into the here and now, lets the past go, and sees a happier family future. He rushes out to buy that mammoth turkey for the Cratchit family, and has a great holiday dinner with his nephew’s family. Take that story as a warning tale. Family members, especially adult children and elders who pass on their anger, hurt, resentment, and scars to the next generation are dooming those family members, like poor old Scrooge, to a future in Marley’s chains. Forgiving your aging parents can release you from being bound by childhood neglect, or cruel behavior, that gets passed on from one generation to the next. Plus if your parent needs care as they age forgiveness can be the best tool to help your offer care. If you this comes up over the holidays consider calling a geriatric care manager in your area. They specialize in dysfunctional families. Make a meeting with one a 2013 resolution. Yesterday I talked about step grandparents on the holidays. But what about stepsiblings on the holidays? Stepsiblings are blended together through remarriage not blood. It’s usually a gory blend. The result is one blood child, now known as a stepsibling, is mashed and sometimes pounded into to another blood child’s life. One of the toughest parts of the Mixmaster–aka the blended family–is getting the blood children to accept living together as step brothers and sisters. Awful things happen like one child taking half of the other stepsibling’s room. Disaster follows that can last for decades. Stepparents, caught in the euphoria of their own new romance, many times blindly, leave the next step of their relationship (step-parenting) out of their parental minds. The big question is how will their unrelated blood children love or even tolerate each other–let alone share half a room and half a holiday. Head over heels stepparent-lovers, foolishly expect their own blood children to function as a loving step-family. This instant family (just like instant mashed potatoes if you ever ate them) can be revolting. Most stepchildren are fused into a newly merged household with minimal preparation. Ridiculous sitcom “Brady Bunch” hopes are usually dashed in the first few days of step-siblings getting to know one another. Step kids don’t feel comfortable enough to express their disagreements and conflicts with one another. Or in another scenario, they may just freeze up, not talk. In the worst case, act out in some awful, even catastrophic way. What ‘s an answer for stepchildren during the holidays? One can be to create a new family ritual.Grandparents can help with this. A Dad commenting on the Newton massacre suggested continuing Christmas or holiday rituals in every family in Newtown as a small healing process .The glue that holds families together whether devastated, happy or thrown together in divorce and remarriage are rituals. So with a stepfamily and stepchildren ,create a new ritual. Rituals patch up disputes and give us the architecture of a year full of celebrations to mark family history. They are the touchstones for rites and family passages and keep us gathering over and over again to celebrate and observe those landmarks. Rituals also give form to every day we spend and are the counterpoints of the turning clock when the family can gather and talk, share and gossip. So take a small step towards healing a family of divorce and create a system of rites that you repeat every holiday. Here is a list 50 family rituals for Christmas if you need some ideas.